Protect your pad investment with this “disposable” pad liner from 5 Star Equine Products, Inc. Because it is made from wool (just like the 5 Star pad) it still provides all the benefits of wool for your animals back, and it will not slip out from under your pad. Successful field testing has gotten rave reviews on this newest product from 5 Star. 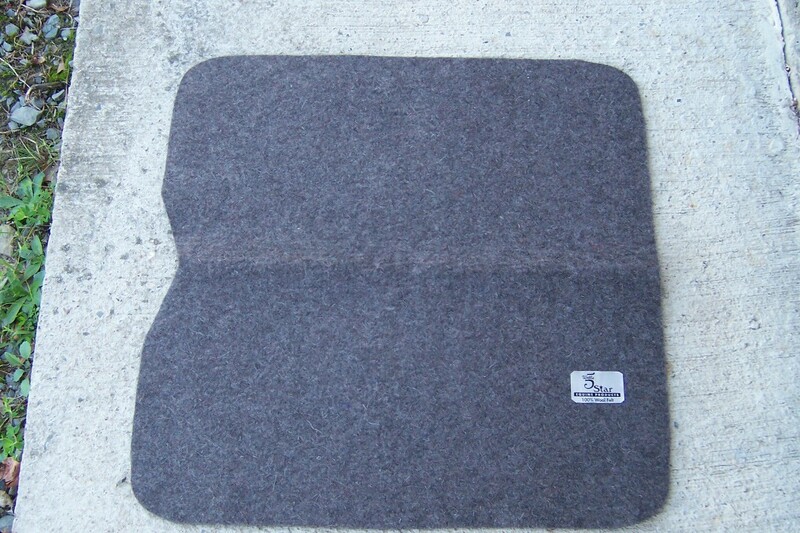 Made from ¼” felt, it is designed to be the “dirt catcher”, so your pad will stay clean and pristine! The liner can be hosed down to clean, but when it is “used up”, turn it into a cat/dog blanket or boot mat and get a new one for under your 5 Star Saddle Pad or contoured Saddle Blanket. It can be trimmed with scissors to fit a custom pad. Liner is cut square but will quickly conform to the pad contour. Standard size is 30”x30” and full skirt size is 32”x32”. Available only in color shown, there is no leather on this one.